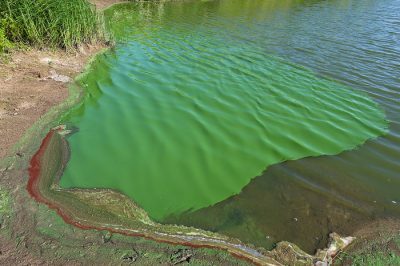 CURRENT seasonal conditions are condusive to helping blue-green algae thrive in farm water supplies, Victoria’s Chief Veterinary Officer, Dr Charles Milne, has warned. A cyanobacterial aggregation more commonly known as a blue-green algal bloom. Wikimedia Commons. Dr Milne is urging livestock owners need to remain alert, as blue green algae poisoning is usually seen in late summer and early autumn, and can result in poisoning of livestock, including pets. ““As there is no specific treatment for blue-green algae poisoning, producers should check farm water supplies daily for blooms, as this remains the most effective way of preventing stock deaths. “However, the colour may range from pale green to dark brown. Those that do not die immediately often suffer severe liver damage. This may lead to the development of jaundice (the yellows) or photosensitisation over the next few days. Dr Milne said those that recover from these ailments often suffer from chronic ill-thrift. If a suspicious bloom is noticed, stock should be removed as quickly as possible, and a safe alternate water supply provided. “Where possible producers should identify an alternative water supply, prior to their primary source of livestock drinking water being affected by a bloom. There may not be time to identify an alternative water source once the primary water supply is affected”, said Dr Milne. Source: Agriculture Victoria. For further information on blue-green contamination visit agriculture.vic.gov.au/agriculture/farm-management/bluegreen-algae-issues.